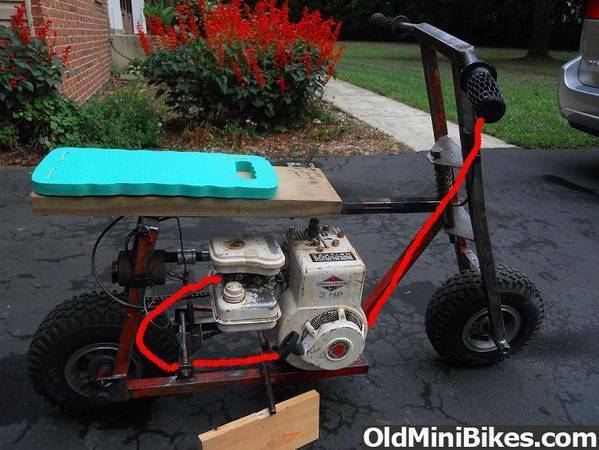 Quick fix would be to shift the motor, fromthe pic looks like the enine plate has plenty of room. @Tanksareus- I had considered that, but there really isn't any room. The bolt pattern on the bottom of the engine (where it mounts to a frame), is snug up against the bolt holes in the plate that's welded to the frame. 1. 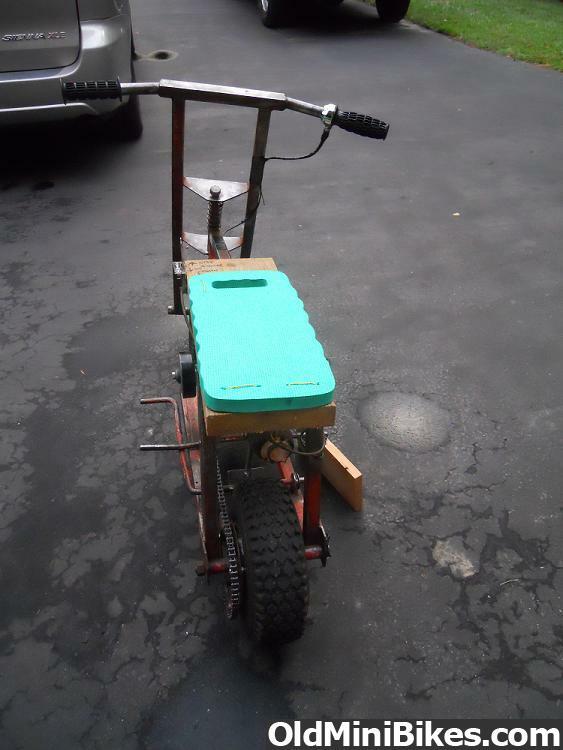 Take off the scrub brake and either go with a drum or band brake. 2. Use the mounts for the scrub brake (already welded on) to install a jackshaft. 3. 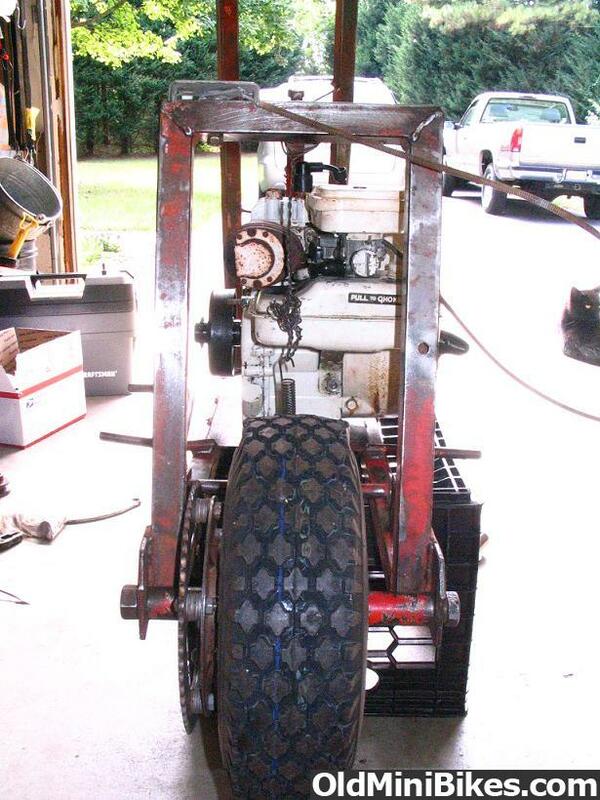 Put the centrifugal clutch on the jackshaft, and run the #35 chain from the clutch on the jackshaft to the sprocket. 4. Install either a different gear or pulley on the crankshaft, and also another gear/pulley on the jackshaft, and run a belt/chain around those two. Is there any issue with running a centrifugal clutch from the jackshaft instead of the crankshaft? Okay, thanks for the advice! I'll order a sprocket. I don't see many with only 5 bolt holes on them. It will raise the stall rpm of the clutch if you try to add in gear reduction going into the jackshaft. What is the distance between the rear axle mounts if its not too much trouble? @rmm727- I went out and took a few measurements and started drawing a diagram. But the distance between the rear axle mounts is approximately 8-3/8 inches, give or take a 16th if an inch. There a slight bend in the left rear axle mount. There is also approx. 3/4" from the sidewall of the tire to the center of the rear sprocket, and 1/2" from the center of the rear sprocket to the inside of the rear of the frame leg. And 6-1/2" from the center of the scrub brake shaft to the center of the rear axle. @mac- Wow!! Are all those 5-bolt hole patterned sprockets? @Harleys Papa- I think I will probably/eventually get the 4.5" Brake with the Anchor Backing Plate, but I kind of like the thought of being able to switch out sprockets with the hub setup that's on my bike. I also took apart the rototiller gearbox that came with the engine. I did a little searching online and found an owners manual for it in a PDF file. 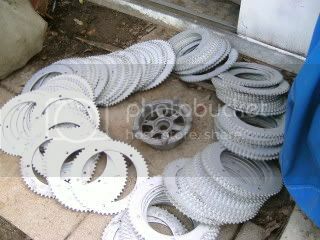 It had a parts list and I found out that two of the sprockets inside used #35 chain, and I think might be the correct Inside Diameter to be used on the bike. It's also threaded with the same 3/8"-24 bolt pattern that is used in the driveshaft on my engine. I need to clean up the sprockets and count the teeth still, they're covered in this really sticky/thick grease which is just shy of impossible to get off, haha. Okay! Update! :laugh: I went out tonight and got a Hilliard 12 tooth Centrifugal Clutch at Tractor Supply. I put it on the shaft and it fits or seems to at least, so I bolted it on. I am gonna try and put the chain on tonight if the rain lets up. If not, I'll do it in the next few days. On another note, I had put it in the shed for the time being, and while I was gone to help my cousin move, my dad decided he wanted to spray the shed with paint. 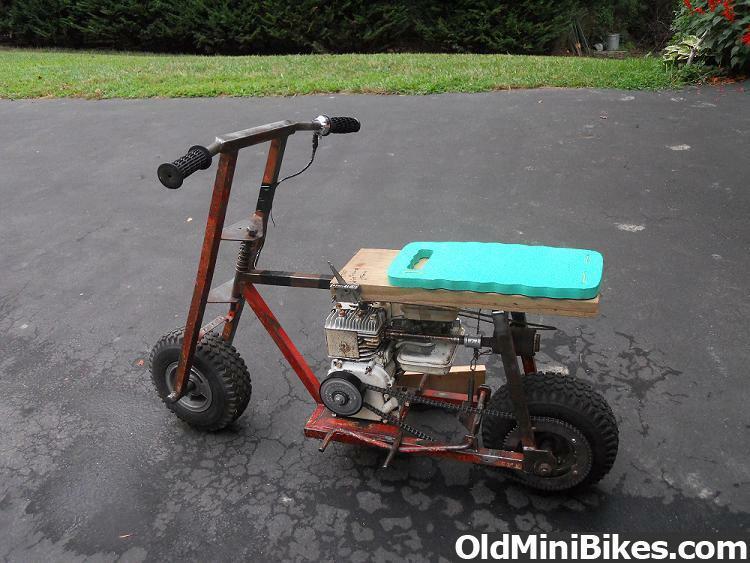 So when I returned, it appears as if my minibike has some sort of spotted grey flu. Joy... :blink: Oh well, you can only see it up close. Here's a link to the video I took. I put it on my Flickr page. Enjoy! (I am pretty sure I didn't have the choke set right, so it moved a tad slow at first). Nothing beats the first ride on a bike. 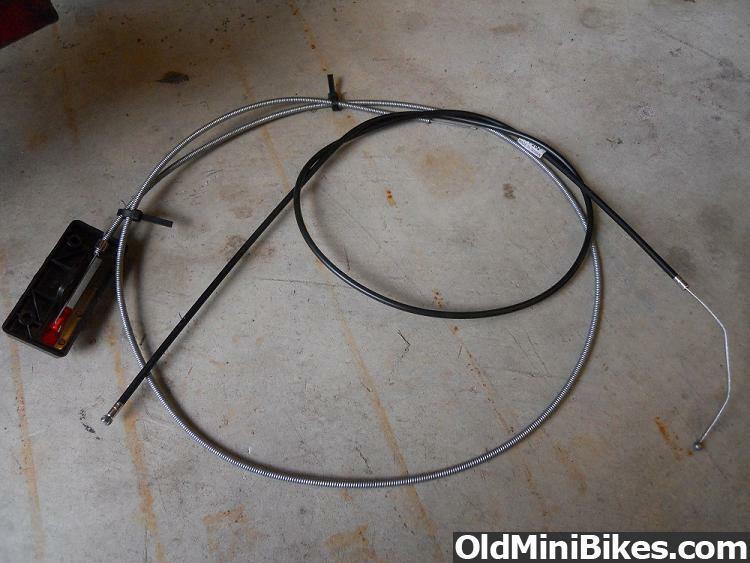 The throttle cable looks a bit old, I would replace it if you can. 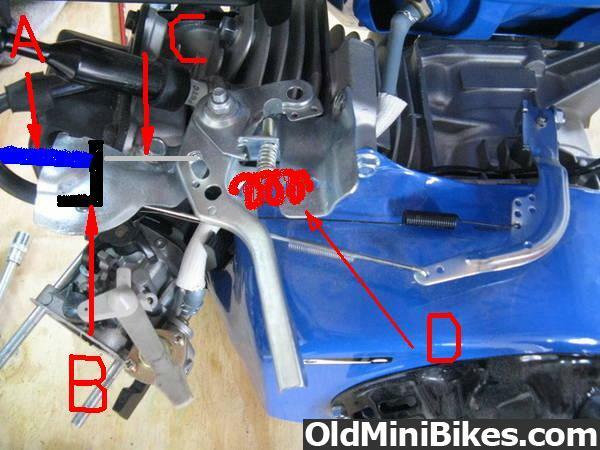 Also try a smoother line from the throttle to the carb, cables don't like sharp bends, put in a pic hope it helps. @Wheels1950- Haha, that would be cool, but I doubt the neighbors would approve. I wish I knew the original owner, to get some tips/hints on to what stuff worked best on the bike. The throttle cable that you said appeared "old" was something I rigged up after the one I bought with a kit didn't seem to stay in place. 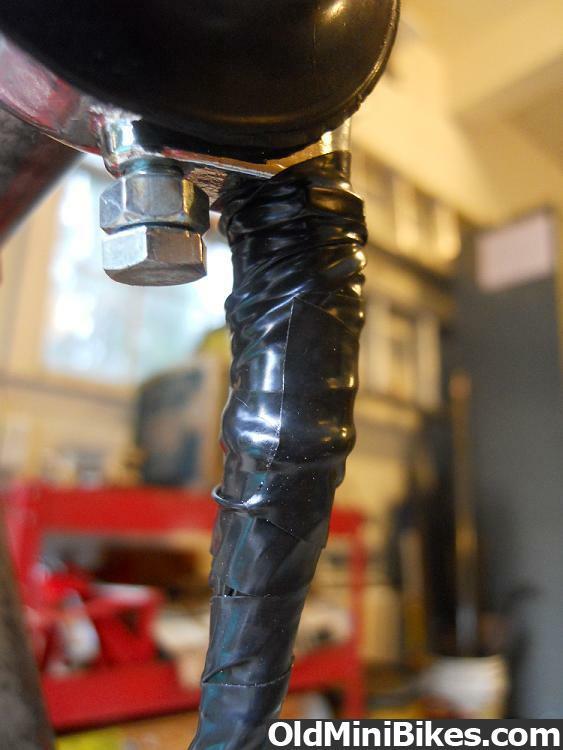 When I turn the twist grip throttle, instead of the cable inside the tubing moving, the entire tubing just moves back and forth, even when I tried to electrical-tape it in place. So I rigged up one with a bicycle cable and some plastic tubing cover from said bicycle, and then wrapped the heck out of it with electrical tape. But it didn't work either. I'll get some pics of it in a bit to better explain. Okay, so I took some pics and tried to do a drawing of the problem I am having with the throttle cable. 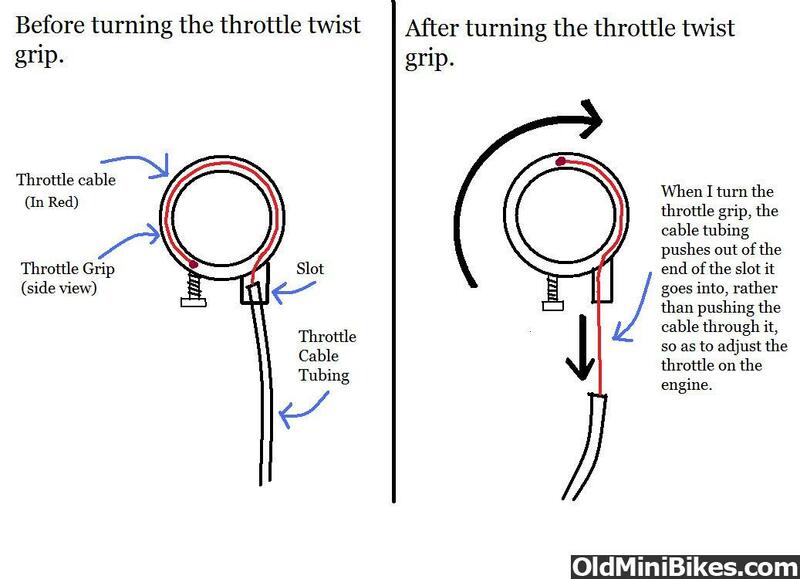 When I turn the throttle twist grip with the regular throttle cable attached, the tubing that the cable runs through moves out of the slot, instead of just the cable moving inside of the tubing. I tried to rig something together originally with some bicycle throttle cable and some extra plastic cable tubing I had, and wrapped it in electrical tape to hold it in place, but after a certain number of bends, the plastic snapped and it bowed outward, and wouldn't turn, or turned with much effort and difficulty. Is there an easy way to fix this? I don't mind using "unorthodox throttle methods", but I would rather have control up by my right hand for throttle adjustment, as at higher speeds, the current method I have rigged to the seat makes me a little uneasy. Thought that might be your problem,was sitting thinking about how to word the advice without insluting your intelegence. Have learned that you just have to say it like it is , otherwise you would be here asking for help. 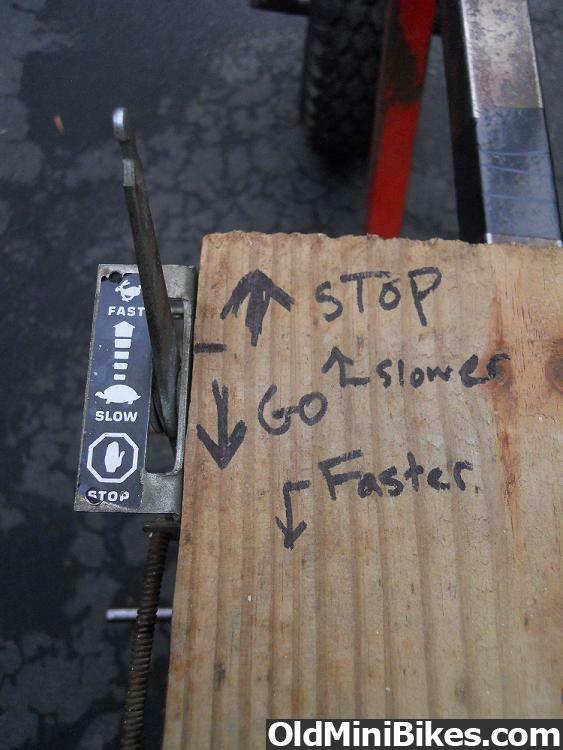 Throttles and cables are designed to pull and linkages to push. You got it Tank I couldnt have have done better. Okay, thanks! I appreciate it. I sort of figured my problem had something to do with "B", the bracket that holds the outer cable sheath. I was hoping that the electrical tape I was using to wrap the cable sheath to the frame would do a decent enough job at holding it in place, and keep allowing the cable inside to move freely, but that isn't working too well. Hence the reason I tried the bicycle cables and plastic sheathing I had to try and make it work, but it wasn't rigid enough. I guess I'll need to find/make a bracket and then figure out a way to mount it. I also need to figure out a way to mount "C", the other end of the cable, that connects the throttle control link to the engine. I think I have a cable-pull piece from the sacrificed rototiller that will work. I'll give it a shot, take some pics and report back my findings! Rob, hadn't thought of it like that! Haha. Maybe I need to get one one these to put on it.